Festival of Frugality - How To Eliminate The Muda And Live More Frugally Edition!Eliminate The Muda! It’s an honor to host the first Festival of Frugality for this decade! Since most of us use the new year to turn over a new leaf and improve our life I’ve decided take this opportunity to reintroduce you to the concept of Elimination of Muda [mooda]. Here is a way to save a lot of motion in the kitchen for breakfast. The Smarter Wallet shares a Healthy Breakfast Idea: Rethinking Oatmeal. Just slap it between to pieces of bread and call it a sandwich! A new rage in frugality is eating locally. You can’t get much more local than your backyard! Miss Thrifty shares insights on Growing Brussels Sprouts for Christmas. Traveling anytime soon. Finding Orbitz Promotion Codes to Cut Travel Costs is a great resource from Personal Finance Analyst. Cut down the amount of inventory in the kitchen with the Wealth Pilgrim present Free Holiday Weight Loss Program – Modern Miracle or Flash in the Pan? It’s a free plan to help you lose weight. One you can stick with and one that will work – starting today. Why do more than necessary? Just go ahead and retire early. My Wealth Builder shares a short list of what you need to do in Strategies For Building Wealth and Retiring Early. Funny About Money make the case that sometimes it pays to hire the professional in When DIY Doesn’t Save Much. If he gets it wrong, he’ll have to do it over and that is just muda! Free Money Finance finds time more valuable than any deal that requires an overnight stay at Wal-Mart. Even I Have My Limits. If we are not careful with our drive to frugality and creating wealth we may end up wasting time that should be spent enjoying what we have worked so hard for. In the last of his 14 part series Get Rich Slowly shares It’s More Important To Be Happy Than Rich. Interior Design Info comes from a different realm of the blogoshpere but is also dedicated to elimination of waste. Check out this article on How To Make Your Window More Energy Efficient. Taking these steps means you no longer have to overproduce heat. Another view on frugality is the overproduction of mental energy. Oilandgarlic’s blog presents How Not To Be That Bitter Old Person In The Cubicle. Out of Debt Again shares how frugal her grandmother was with My Grandmother Was Truly Frugal. This list is long and there are lots of ideas here. It’s a shame we have wasted so much of what our ancestors learned! Saving money is always a great thing. I love how Free From Broke took things (tools) into his own hands and saved with A Little Investigation and Elbow Grease Saved Us $150. If you are faced with bad credit or no credit how do you find the best deal on a credit card? The Doughroller has done the work for you with his article How To Find A “Good” Bad Credit Credit Card. Monroe on a Budget shares how to track the money you save with How You Can Track Your Coupon Savings? Northern Cheapskate helps you get the most out of those gift cards with Be Smart With Your Gift Cards. Being frugal is all about making the most of your resources, when it comes to cash is there any better way than investing your money in the most efficient manner possible? Debt Free Adventures explores the Traditional and Roth IRA Contribution Limits. Taking a look at all these articles, I would argue that they are the best articles yet on frugal living this decade! Participate in a future Festival of Frugality. Check out the submission guidelines and hosting guidelines. 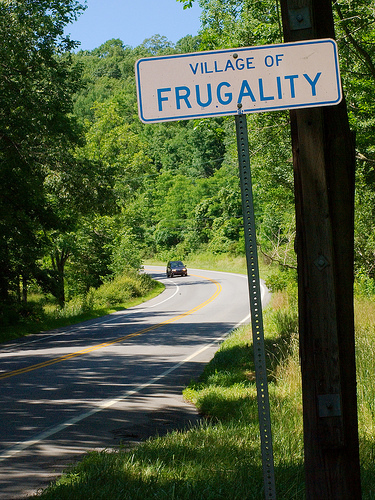 25 comments to Festival of Frugality – How To Eliminate The Muda And Live More Frugally Edition! Thanks for featuring my Brussels sprouts post! .-= Miss Thrifty´s last blog ..New Year’s resolutions: more blogging, less waste, garden makeover. =-. Good Festival! Thanks for hosting, and thanks for including Funny’s latest adventure in swimming pool management. .-= Funny about Money´s last blog ..Financial Freedom: Education and training =-. Thanks for including my post. I enjoy your blog and I’m finding a lot of new blogs to read thanks to your festival. .-= oilandgarlic´s last blog ..Festival of Frugality Is Up =-. Thank you for hosting and including my post! Great job! Lots of good reads! Thanks for including my post! .-= Christina @ Northern Cheapskate´s last blog ..Sign up for The Home Depot Newsletter for Savings =-. Thanks for such a fabulous carnival! 🙂 Happy New Year! .-= The Digerati Life´s last blog ..Investing For Beginners: Basic Steps To Start Investing =-. This was an excellent way to introduce everyone to muda, definitely one to bookmark. I especially like the picture! .-= David @ MBA briefs´s last blog ..The biggest marketing mistake you can make: 5 ways to measure customer satisfaction and keep your existing customers =-. My pleasure to all! I hope to have the chance to do it again sometime! Star Money Articles and Carnivals for the Week of Jan 4 | Breaking News Now!